Ireland have recruited Matthew Mott and Carl Hopkinson to their coaching staff as they build up towards the World Cup. Former Queensland batsman Mott and Hopkinson, currently Sussex club coach, will join Ireland during the ongoing tour of Australia and New Zealand. 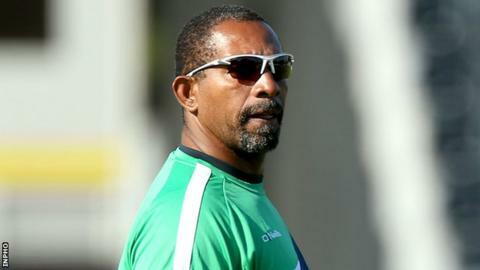 Mott, who has also been head coach at Glamorgan, will be Phil Simmons's Ireland assistant while Hopkinson is a fielding specialist. Simmons said the duo would bring "exceptional skills to the squad". "Matthew has extensive coaching experience both in Australia and abroad and comes with a proven reputation," said Simmons. "Carl also is highly regarded in coaching circles with his work both domestically at Sussex, and internationally with the England Under-19s and Lions squads." Cricket Ireland performance director Richard Holdsworth explained the rationale behind the support staff expansion. "Matthew knows the Australian conditions well and has vast experience of playing on these surfaces while Carl's experience in elite fielding should help sharpen the squad in this area," said the Cricket Ireland official. Mott will join the squad on 30 September until 21 October and then again for the duration of the World Cup which starts in late February. Hopkinson, currently club coach at Sussex where he works with the second team as well as being the club's fielding coach, will join the Irish squad in an assistant coach capacity with a main role as fielding coach. He will link up with the Irish on 6 October until the end of the tour 17 days later and will then rejoin for the World Cup campaign.